Hooray! A cookie I can share with friends, rather than the trash can. 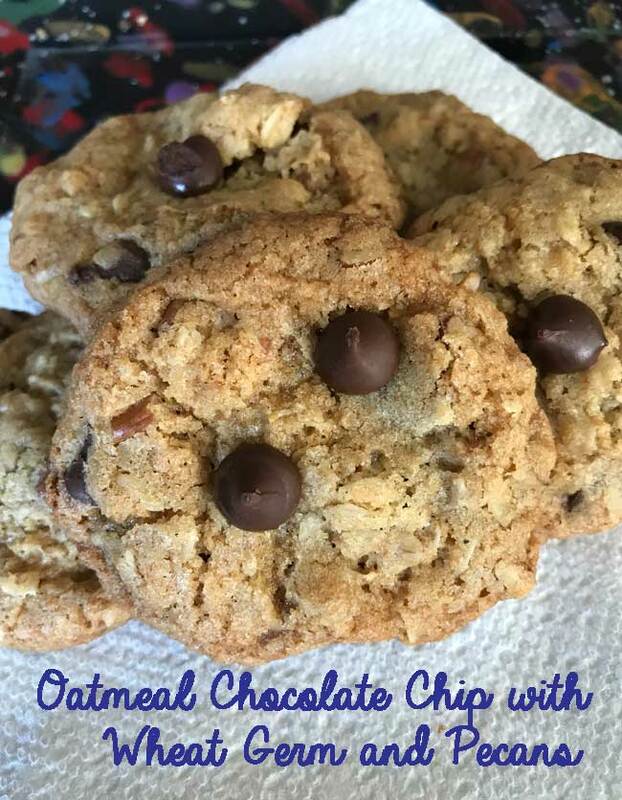 These oatmeal chocolate chip cookies are great. They’re thin, but chewy and slightly crisp around the edges. The wheat germ adds some texture and flavor, but the cookies don’t taste like health food. Update: I’ve been making these cookies for a few years now. 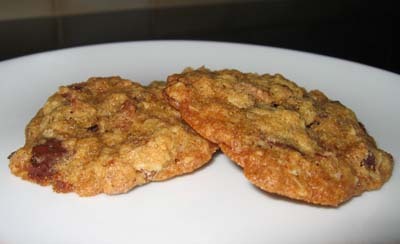 Like most cookies, the thickness and crunchiness will change with the amount of flour used. When I first made these I used a lighter hand when measuring the flour (189 grams) and got cookies that were delicious, but not as nicely shaped. Whisk together flour, wheat germ, salt and baking soda. Set aside. With an electric mixer, beat butter and both sugars until creamy. Beat in vanilla and eggs. Stir flour mixture into butter mixture, followed by oats, chocolate chips and pecans. Chill dough for 1 hour if needed (if you weighed the flour you probably won't have to). Preheat oven to 350 degrees F. Drop dough by generously rounded teaspoonfuls onto ungreased cookie sheets. Sprinkle tops with a little sea salt, then bake for 8 to 12 minutes. Let cool on cookie sheet for 3 minutes. Remove and cool on wire rack. ps, I halved the recipe and it came out fine. I love it…thanks Anna! I copied and pasted to my “notebook” for future reference. You’re a gem!